Protect the breadwinner. It’s what you might expect an insurance professional to advise. It makes sense to cover the singular source of a family’s income – but what about the value a stay-at-home spouse contributes? The Pew Research Center reports that one in five parents in the United States – or about 18% of the population – do not work outside the home. A breakout also shows that the number of stay-at-home dads continues to increase. These parental partners provide crucial support to families. There’s no paycheck stub to prove it, but non-working spouses do bring home the bacon. They need life insurance protection, too. Salary.com calculates that the median annual salary a stay-at-home mom would earn for her average 96-hour workweek (because we all know they don’t punch the clock at 5 pm each weekday) in 2018 would be nearly $162,600. She received a $5,000 raise from the previous year’s calculations, so it must have been an excellent performance appraisal. Sure, nobody actually pays stay-at-home spouses for their services. This calculation, however, demonstrates the value they bring – and it illustrates the loss a family would incur the event of their death. The cost of losing a spouse is incalculable, but there truly is a dollar figure that can be attributed to what a stay-at-home mom or dad contributes to a family. Without that contribution, you will be forced to pay the going rate for someone else to do it. Life insurance is a solution to cover these expenses. New York Life reminds us that needs and resources are different for each family, so there’s no hard-and-fast rule. A generally accepted approach to determine the amount of life insurance coverage for a stay-at-home spouse starts with calculating the value of the services they provide which would have to be outsourced. Then, multiply this figure by the remaining number of years the youngest child has before completing college. Let’s use the current stay-at-home mom salary.com calculation as an example. If your youngest child is 12 years old, it would be another 10 years before they graduated from college. Your stay-at-home spouse would contribute an economic benefit to the household of up to $1.62 million dollars during that time. A number of factors might change this final calculation, such as future earnings by the surviving spouse, age, and available alternative financial resources. This last factor is important, especially if the stay-at-home spouse chooses this role expressly to care for the family. 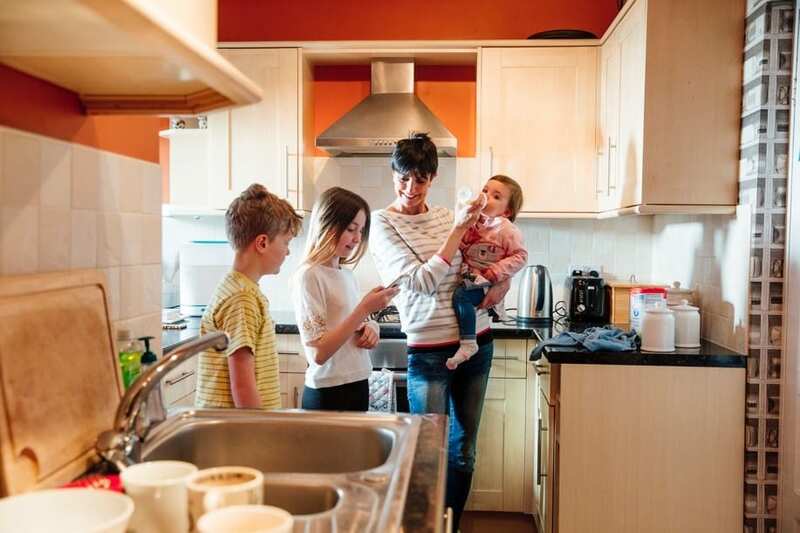 The Pew study previously cited also notes that spouses who choose the primary role of a stay-at-home family caretaker tend to financially secure. It might be necessary to have a high level of coverage. The Pew study also notes that stay-at-home spouses who actively choose the role tend to do so because there are young children to care for ­– all the more reason to provide adequate insurance coverage that would compensate for this care upon the unexpected death of a parent. NerdWallet advises couples with a stay-at-home spouse to investigate term life insurance policies. These policies can be set up to offer coverage only during the time that there are financially-dependent children living at home. Term life insurance is usually less expensive and offers more financial coverage for the monthly premiums. Generally, this is because the coverage ends on a specific date. Whole life insurance doesn’t have an expiration of coverage, but it features a tax-deferred cash value. The monthly premium is locked in permanently. It’s more of a long-term investment than merely protection against the unexpected death of a spouse. We can help you explore the insurance options for your stay-at-home spouse.